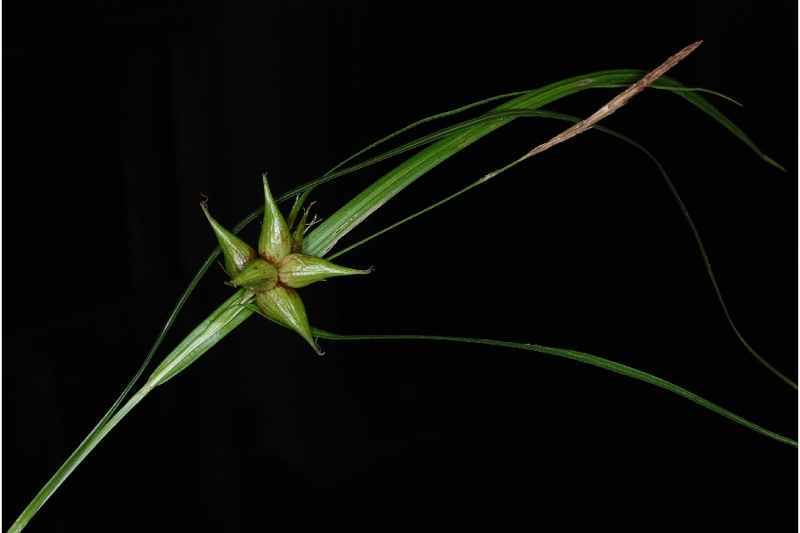 Carex intumescens.Doug Goldman @ USDA-NRCS PLANTS Database.USDA-NRCS-NPDT (Accessed 4/2014). Carex intumescens is a perennial sedge, stems solitary or small clumps, 30-90 cm tall. Leaves alternate, blades 0.4-1.1 cm wide, uppermost non-bract leaf with sheath over 1cm long. Flowers monoecious; male spike at top of stem, 1-5 cm, with stalk 1-6 cm; female spikes 1-4, 1-2.7 cm long and wide, on stalks to 1.5 cm, perigynia 1-12, large, shiny, 1-1.6 cm long, 0.3-0.6 cm wide, base round, beak 0.2-0.4 cm, poorly defined, achene 3-sided, 0.4-0.5 cm, style persistent; blooms and fruits June-July. Habitat: Open swamp forests, wet meadows, soil pH 4.8-6.9, toleant of shade, fire, and anaerobic soil, intolerant of drought, salt (USDA, NRCS 2010).